One of the many areas where the Frontier Centre for Public Policy leads the discussion on new thinking has been our aboriginal policy file. Among a steady stream of commentaries and research in this important area has been our ground-breaking work on measuring the quality of governance in prairie First Nation communities. Back in 2006 our organization released its first Aboriginal Governance Index, a project where we went onto to Manitoba First Nations to survey grass roots perceptions of the quality of local governance. In the following years Frontier expanded our governance survey to Saskatchewan and Alberta and we also expanded and refined the methodology in partnership with Compas Research, a respected Toronto-based opinion research firm. Services – How well are health, education, social and other public services delivered? Elections – How fair and impartial are votes for leaders? Human Rights – How much regard is assigned to basic rights? Transparency – How well-informed are citizens about their government? Based on the thousands of interviews conducted we were able to measure the higher performing First Nations. The most recent AGI was released earlier this year and can be downloaded by clicking here. With the support of the Lotte and John Hecht Memorial Foundation, Frontier has been fortunate to provide some recognition of the highest scoring First Nations in each of the three Prairie Provinces in the form of a plague and a cheque for $5,000. In June we traveled to the tribal administration office of the Siksika Nation in Alberta to present their award. On July 12th we presented the Saskatchewan award to the Ahtahkoop Cree Nation, north of Prince Albert before an enthusiastic crowd and ceremonial feast at their community hall. Last week, we were delighted to present the Manitoba award to the Fisher River Cree Nation in Winnipeg. Finally, we also present an award for the “most improved” First Nation in our survey. This is for a First Nation that has participated in the AGI for most of our annual surveys and has shown steady improvement. This year this goes to Saskatchewan’s Lac La Ronge Indian Band. Plans are underway to deliver the award to the community at a convenient time. 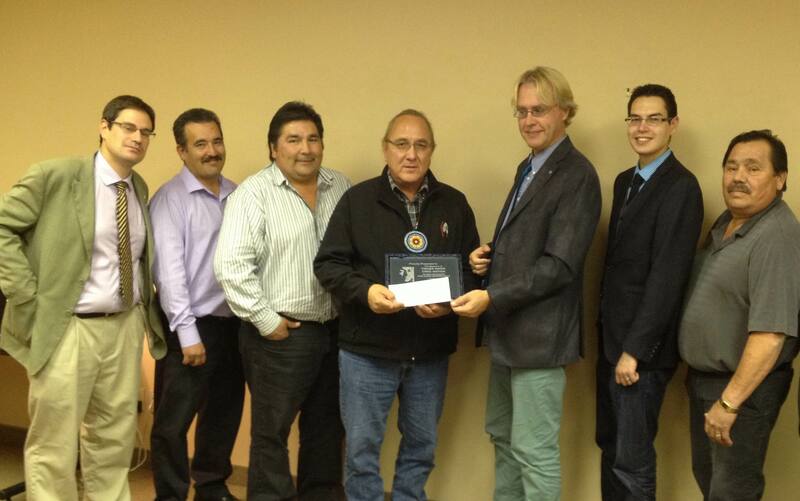 Below is a picture from that presentation with Chief David Crate and several of Fisher River’s band councillors. The Chief and council were pleased to achieve this outside recognition and invited Frontier to visit their community later this year. In all of our meetings we were very impressed with the solid, often understated, quality of leadership apparent at each of our award winning First Nations. Watch for more discussion of improved First Nations governance from a newly revamped version of the AGI next year.